With two young soldiers standing sentry once again Saturday morning two dozen Muslims — some in traditional dress — approached the steps of the National War Memorial. They came in peace angry at the tragic events that occurred there just three days ago. 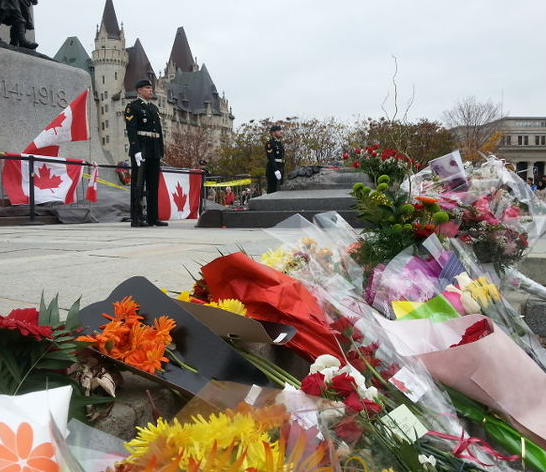 As numerous Ottawa Police officers guarded the site — rifles in hand — actively scanning the crowd, the group, led by Sheikh Salman Al-Abidi, placed an arrangement of red roses onto the Tomb of the Unknown Soldier. He spoke in Arabic as Biraq Hussein from Ottawa’s Al Mahdi Centre translated. “What happened, actually, is not only condemned by us, is not only condemned by all religions, but also condemned by humanity. This is inhumane, this is unacceptable by anyone,” he said. Many in the large crowd of hundreds applauded. Cpl. 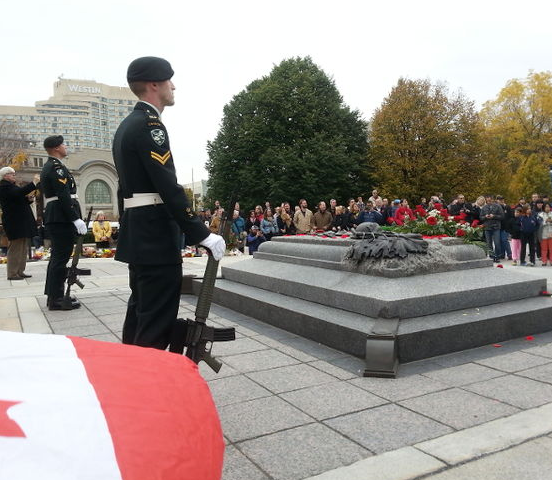 Nathan Cirillo, 24, was gunned down in an Oct. 22 terror attack while guarding the Tomb of the Unknown Soldier. His killer, 32-year-old Michael Zehaf-Bibeau — a Canadian-bred Muslim convert —‚ was later shot dead in Parliament Hill’s Centre Block. Two days prior, 53-year-old Warrant Officer Patrice Vincent was run down with a car and died in St-Jean-sur-Richelieu, Que. Another soldier survived the attack. Martin Couture-Rouleau, 25, fled the scene and was shot and killed by police. Couture-Rouleau was also a radicalized Muslim. Nationwide, the Islamic community has widely rebuked the pair’s actions yet have been bracing for the backlash. Threats were sent to the B.C. Muslim Association earlier in the week and the RCMP is investigating. Norah and Roy Comeau of Alta Vista missed the sheikh’s speech but soon after approached a Muslim man and apologized to him for the retaliation against the Islamic community. “I just want to say, on behalf of all of us, I regret that that’s been happening … we’re all in this together, and it hurts everybody,” she said to the man. The couple then told the Sun it’s unfair to generalize. “This is individual people that are choosing to follow particular actions and we don’t, maybe, always know why, and it’s not right to be attacking other people because of the actions of one or two,” said Norah Comeau. “Let’s try to support one another as fellow human beings.” Roy Comeau said we’re all Canadians and “we can live here in peace.” “Unfortunately, there will be some individuals who will try to separate us,” he added. 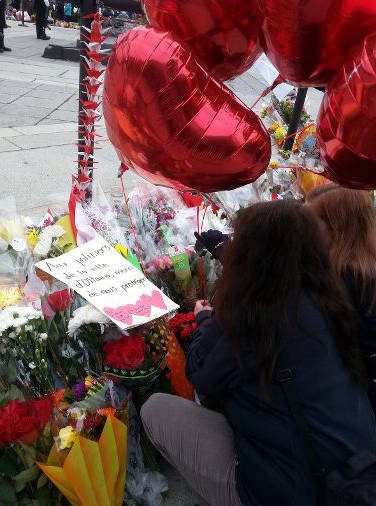 What couldn’t be separated was the onslaught of bouquets, stuffed animals, and candles surrounding the perimeter of the memorial, and growing by the hour. Veterans were among thousands of people visiting the site. “We all had their job at one time or another, not necessarily at the War Memorial but we’ve been in harm’s way; just such a young person,” said Terry Kelsey of Rockland, who joined the army in the 1960s with the Lord Strathcona’s Horse (Royal Canadians) regiment. Many military personnel were on hand. “Everybody’s very respectful, tourists included, all saying hello, and so on, which they probably wouldn’t normally do,” said Kelsey. A fair share of soldiers, said Kelsey, were dressed in plainclothes, as ordered by the Canadian Armed Forces earlier in the week. “For God’s sake, put the uniforms back on,” he said, calling the missive a knee-jerk reaction. “The most valuable thing to a soldier is his uniform,” Kelsey continued. The grounds of Parliament Hill also re-opened to the public Saturday with tours resuming Monday.